Finally I have a few recipes up the sleeve to share. Although, to be honest, these aren’t so much recipes as food combinations we’ve been having for dinner. It’ll have to do, though, until something more inspiring comes along. I’ve had a string of culinary disasters in the kitchen recently and while part of me (the part that is still trying to remember which cupboard we unpacked the measuring cups in to) knows it’s the teething period of cooking in a new and untested kitchen, part of me just wants to go down to the pub on the corner and get their soup of the day for dinner. Again. Oh well, we keep trying. A dry broccoli and pepita pesto can’t really be blamed on the too-hot hob (unlike the burned-on-the-outside, soggy-on-the-inside pumpkin fritters I tried making for tea on Sunday) but it certainly goes well with the theme of over-crispy offerings and charred remains I’ve been serving from that kitchen this last week. So I decided to stop the train and dish up something so simple it needed but a few minutes anywhere near that hob of hell. Oh, bear with me while I sort out these annoying little glitchettes in the Kitchen. Le sigh. Ca ne va pas! 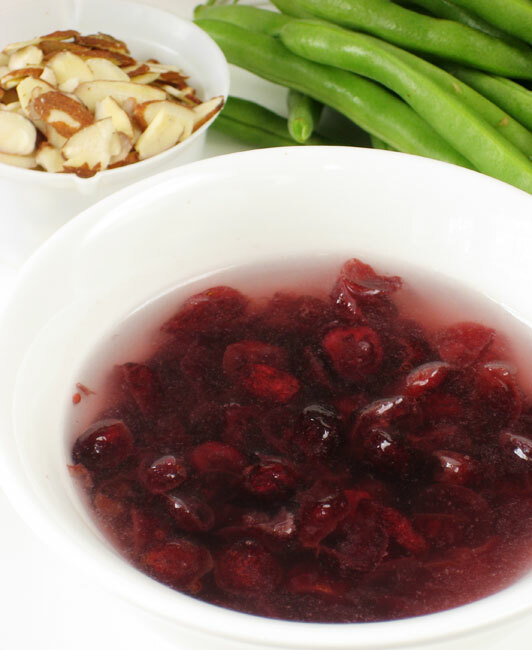 – put the cranberries in a small bowl and just cover with hot water. Allow to sit for 5 to 10 mins. Yummy dish. The green against the red is lovely. For those allergic to nuts do you have any substitution for the almonds? This is being used as a holiday side dish but a few family members have nut allergies and I needed to cook theirs separate, but am wondering what to substitute? First I would ascertain which nuts the allergy sufferers are allergic to; some nut allergists are only allergic to certain types. For example, I know a couple people who are allergic to nuts but can eat pine nuts happily, they not being a nut. Pine nuts, lightly toasted, would work very well with this. Thank you for this recipe! I told the guys at the fire house that I’d bring some kind of green bean for Thanksgiving. But I wanted to stay away from the green bean casserole, and this looks great! 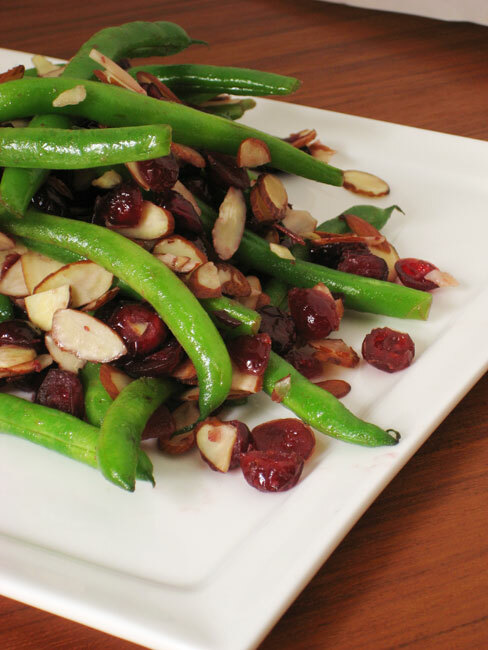 Thank you, I wanted to dress up some green beans, so I bought some cranberries and almonds thinking that would go well with them. And then I started to wonder if I should just cook the beans and add the other stuff when they are done, throw then all in a pot and boil them all together, or what. So I did a quick online search to see if anyone else saw what I saw in the flavor combo and behold, here it is. Stir frying is brilliant, thank you very much. I think I’ll use coconut oil to keep with that lightly sweet theme everything else in the dish has. going to do this Sat. night for a girls game night dinner…Would fresh cranberries work as well. Moisture is already in them.Just add them to beans with almonds to cook? Robyn–thanks for the great recipe! This has become a Holiday favorite, especially since my daughter became a vegetarian and healthier eater! She is not big on the almonds (I love then) but I think the idea of the pine nuts would work well also!